Attach consent forms or any other forms to the appointment. To create a new appointment profile, first mouse over 'Schedule' on your navigation bar and select 'Appointment Profiles'. 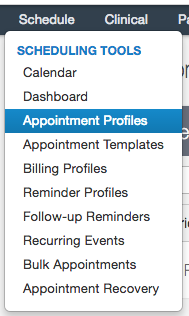 In your appointment profile editor, select '+Add New Profile' in the upper-right hand corner. Make changes as you see fit and select 'Save'. Scheduling: How do I edit my appointment profiles?